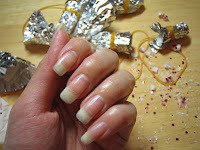 I forgot to post this, but after I removed my Calgel nails, my nails were scary looooooong!!! Of course I cut them already!!! Now you know how strong the Calgel was! It supported my nails to grow this long. OMG!! !